KAREN Kirk is used to her family’s mystery tours being a poor cover for shopping expeditions, so she was delighted when this one unearthed a great day out in Portsmouth, which was both fun and fascinating. Now, normally when I hear these words, it is code for: Dad has bought something off ebay and we’re off to collect it. The kids whine back: “Are we going in?” At which point Dad turns up the radio and we continue our road trip. So imagine my surprise when Dad whispers the words ‘museum’ and ‘Portsmouth’ in my ear. It took me a while to recover but I didn’t let on to Alex, who’s 10, Katy, aged nine and our seven-year-old, Fred. Probably just another road trip to collect stuff dad has bought from ebay … and the poor little things believed me! There were the usual jokes about Dad getting me to navigate (an earlier family day out to Haynes Motor Museum saw me take us on a 28 mile diversion) but we found the D-Day museum with no problems – it was well sign-posted and we didn’t get lost once. There was plenty of parking, and we had no problems finding a spot just outside the museum. 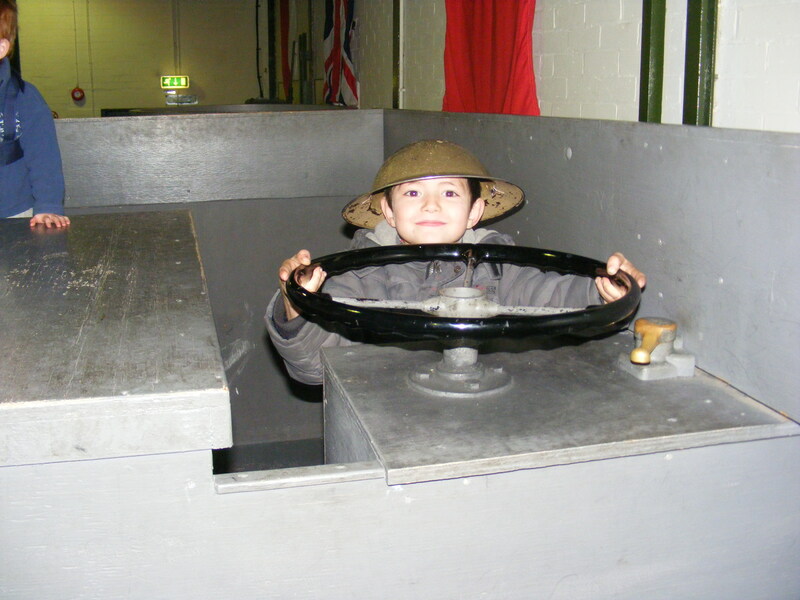 The museum is next to Southsea Castle, which is where we took the kids to look at first. Unfortunately it was shut, but it’s now on our places to visit list. 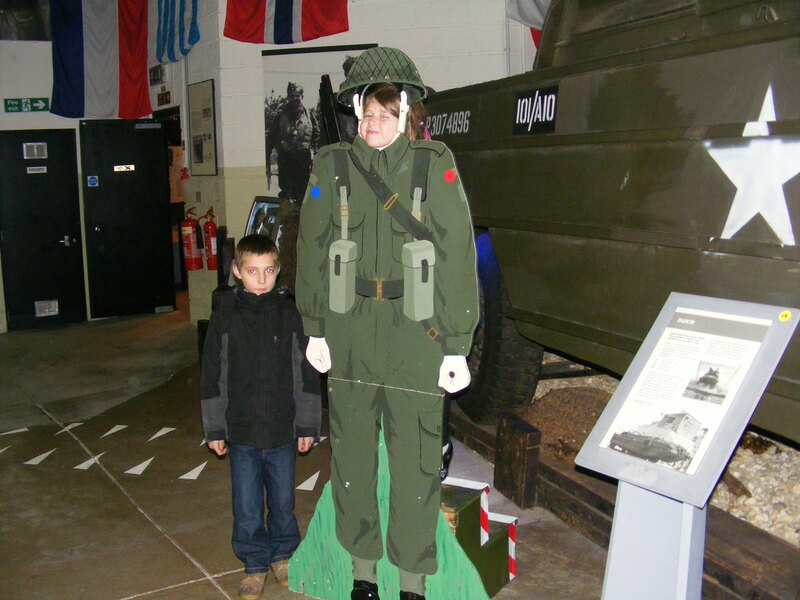 Dad asked our three children if they knew what D Day was – they were pretty good with their answers, so with Dad impressed by their knowledge, we headed into the museum. It is Britain’s only museum dedicated solely to covering all aspects of the D-Day landings in Normandy, France, on June 6, 1944. Fred in his tin hat! The museum’s centrepiece is the magnificent Overlord Embroidery. At 272 feet (83 metres) in length, this is the world’s longest embroidery of its kind, and the Twentieth Century equivalent of the Bayeux Tapestry. But before we looked at it we decided to watch the film that plays every twenty minutes. It was very dramatic, showing used archive film, songs and people’s recollections to create a moving experience that really captured the wartime atmosphere and had all of us watching intently. The Overlord Embroidery was absolutely stunning and the artist who designed it, Sandra Lawrence, used wartime photographs as reference material. We decided it was best viewed further away rather than closer to. It really is a must-see piece, and a work of real historical importance. We actually walked round it twice, each of us commenting on what was our favourite panel and why. There was some light relief from the subject when Fred piped up that it had been knitted by ‘the old grannies who knit Shreddies’ and – like the tapestry – we were all in stitches! There were also extensive displays of personal memorabilia; maps, uniforms, vehicles and other historic artefacts that really helped visitors to understand an event from Portsmouth’s past, which was of truly immense importance. Katy as a soldier. Alex waits for his go! We ended up in the gift shop where we found even more treasures. Again, we set some moths free from Dad’s wallet and also had a wonderful conversation with Sandra who works there. She helped Alex, Katy and Fred choose their gifts, then showed them a book of poems that have been sent to the museum, telling the children she would give them copies of any that they liked. She giggled when Fred explained about the grannies, and carefully explained to him how it was made and showed him a picture of the artist who designed it, who Fred agreed, didn’t look like an old granny. Sandra also gave the children other bits of information – she really was helpful and patient, answering their questions, and was a great asset for the museum, we thought. Dad was pleased with his purchases and I am looking forward to sitting on the sofa and reading the guidebook again. It is one of those places you could visit again and again and never be bored. I also think the gift shop was one of the best I have seen with a great range of books, DVDs, posters, reproduction newspapers and memorabilia from ration books to Home Guard fighting manuals. Best of all the prices were extremely reasonable. The bar has certainly been raised for Dad’s future roadtrips!